...We waste a lot of analytic effort talking about the type of weapon, the timing, the tactics. 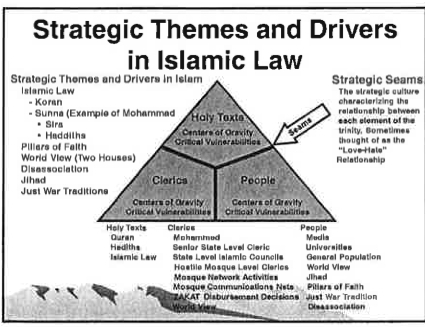 All of that is irrelevant … if you have an Islamic motivation for actions,” Gawthrop said. Even taking down hostile states like Iran is futile, since “there are still internal forces that will seek to exert Islamic rule again..."
"Outside counterterrorists disagree — strongly — with Gawthrop’s take. “This is mind-numbingly stupid and dangerous,” says Aki Peritz, a former intelligence analyst at the National Counterterrorism Center, now with the Third Way think-tank in Washington. “If we were to follow his idea to a logical extension, that means we have individuals in every single government agency, at top levels, from CIA to the Defense Department to members of Congress, that are part of this cabal to destroy Western civilization. If you truly believe that, then this is McCarthyism on steroids…."